Doubt About It: Where Did Your Steelers Spend Their Offseason? Ever wonder what your Pittsburgh Steelers do in the offseason? 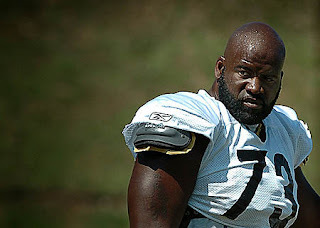 Well DoubtAboutIt.com has got the scoop on offensive guard, Kendall Simmons. Simmons, who also goes by his street name of "Rick Ross", has recently been spotted in multiple MTV, and BET, music videos. That's right Steeler's fans...push it to the limit. Atleast Simmons has his mind in the right place. I'm sure by making this video, Simmons was only motivating himself to block those nasty defensive lineman... to the limit.